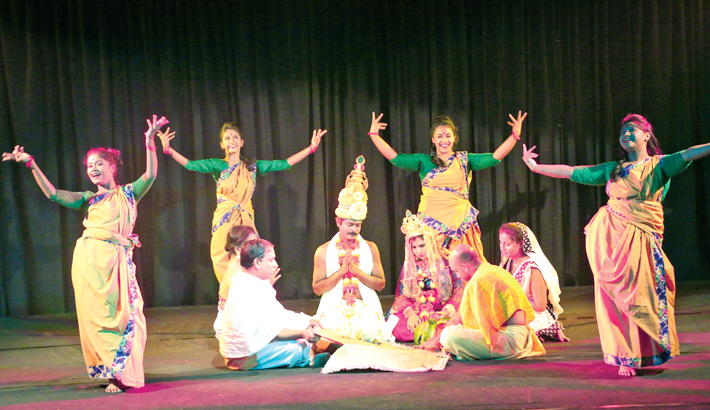 Popular theatre troupe Loko Natyadal (Banani) staged its much acclaimed production Sonai Madhab at the Experimental Theatre Hall of Bangladesh Shilpakala Academy in the capital on Saturday evening. Sonai Madhab is one of the 10 ballads of Mymensingh Geetika, and it bears all characteristics of a ballad. It is woman-centric, it is presented through songs, and it is what can be called a romance that ends with a tragedy. “But, it is noteworthy to mention here that all the female characters for the production have been played by men, a common aspect of ancient theatre in Bangladesh,” he added. The audience can visualise the story in Pala form through traditional music and dance recitals. The play showcased an ancient and common theatre trait of Bangladesh on stage as male artistes played the female characters in the play.